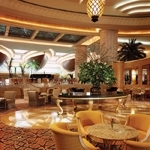 In the heart of the lobby, the elegant Al Nakheel Lounge in Dubai is a favourite gathering place for hotel guests and visitors. There is live music every evening and refreshing selection of premium and non-premium beverages. Al Nakheel also serves high tea and continental breakfast in Dubai; along with a light menu of sandwiches, salads and pastries. Enjoy a decadent chocolate fondue dessert and take advantage of complimentary Internet with any order at Al Nakheel, the Dubai Lounge.